Hot dogs were a huge part of my childhood, from cutting it up and mixing it into my macaroni to boiling them on the stove and eating them for an after school snack. 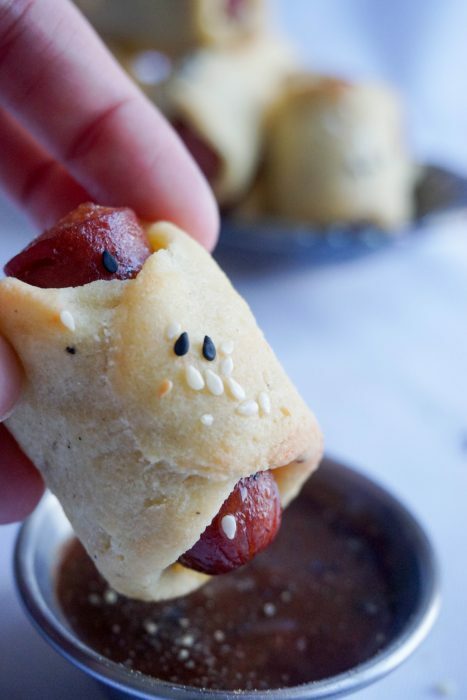 But, my favorite hot dog recipe of all has to be pigs in a blanket. Before turning to keto I searched them out at all events. Although not the classiest of appetizers they were by far the most delicious. Of course I had to remake them low carb style, and so I present to you Keto Pigs In A Blanket. I don’t think a recipe can get much simpler. All you really need to prepare is the crust and I’ve given you a four ingredient crust! It resembles a fathead crust, but without the cream cheese which means less calories per pig. Once you’ve got the crust all you need to do is cut any hot dog of choice into pieces and wrap those babies! They only take 30 minutes total to make which means you’ll always have a go to, sorta classy, super delicious appetizer! And, nothing beats that. Need something to dunk these little piggies in? Look no further, because our Low Car BBQ Sauce is the perfect side. It’s super simple to make and once again, your family won’t know any different. Parties and snack time no longer have to be coupled with unhealthy snacks! 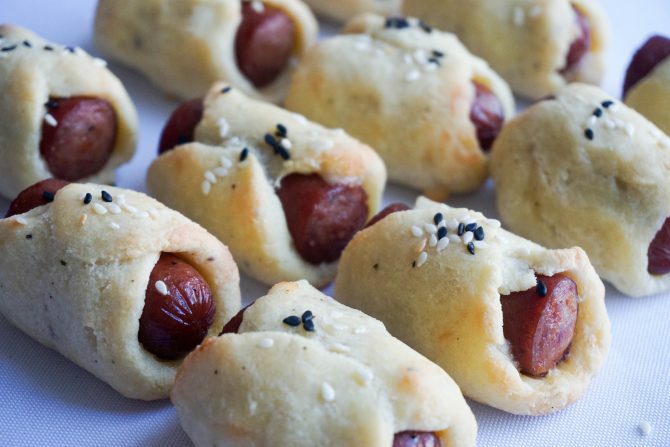 Put this recipe to the test and make these Easy Pigs In A Blanket next time your family wants a snack. You’re welcome! The best part about this recipe is that no one in your family will know they are low carb, including the kids. This recipe is extremely keto and kid friendly so if you don’t want to make 2 or 3 separate snacks to please everyone these are your best option! 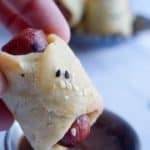 Make these Keto Pigs In A Blanket for your next party or snack time for the kids! Cut each hot dog into 3 equal sized pieces and set aside. Melt mozzarella in microwave and add almond flour and egg. Combine well. Add baking powder, garlic and salt. Combine well. Form dough in hands and split into 12 equal sized pieces and roll into dough. Place dough balls onto a parchment lined baking sheet. Press each ball into oval shape. 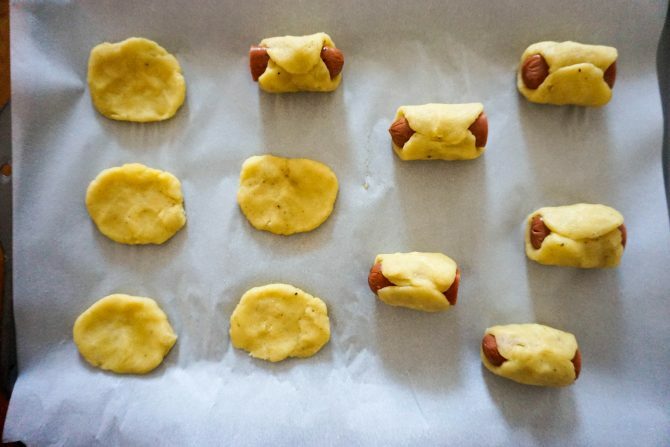 Place each hot dog piece into the dough and wrap like a blanket. Sprinkle with sesame seeds (press down so they stick to dough). Place pigs in 350 degree oven for 17-20 minutes. The nutrition listed is per serving. The entire recipe makes 12 pigs in a blanket. This recipe makes 4 servings which means that 1 serving is 3 pigs in a blanket.